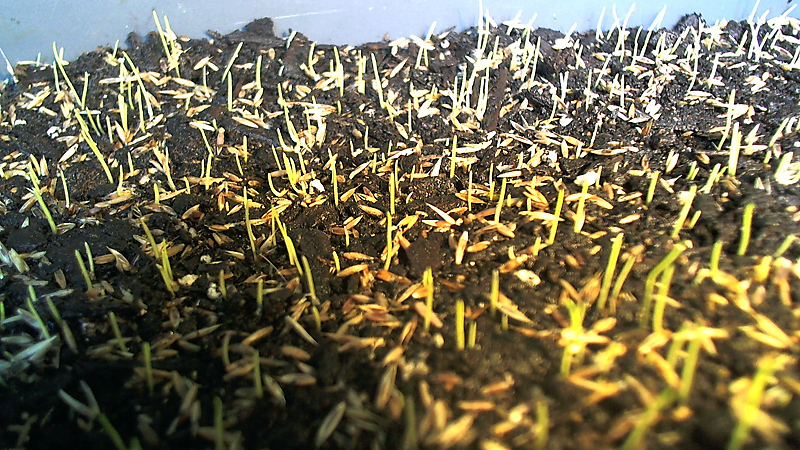 It's day 4 of my indoor grass experiment and things are coming along nicely. 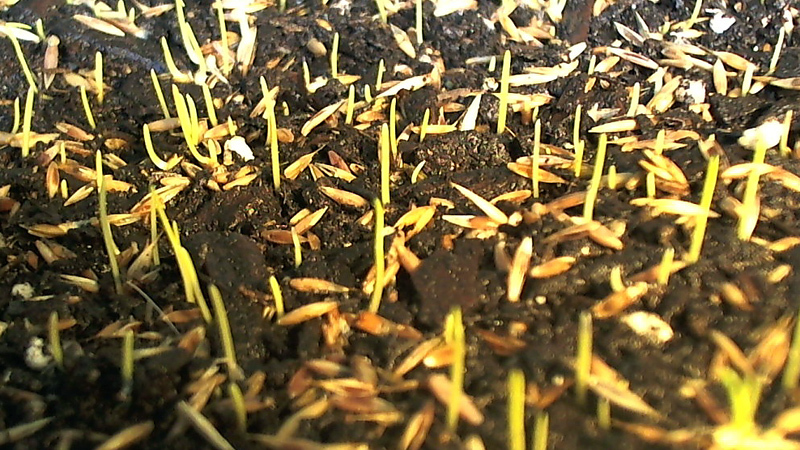 More seeds have germinated and the blades of grass are anywhere from 1/4" to 3/4" long at this point. I've removed the coffee filters that I was using to help retain moisture since the weight of the wet paper was causing the longer shoots to bend. The potting mix is retaining moisture well but I will continue to mist the top of the soil a couple of times a day to make sure the roots have plenty of water to continue to grow and so seeds keep germinating. Jonathan Green Dense Shade comes with a few different varieties of grass seed. Not all of them germinate at the same time. Every other day I've dumped out the water that collects in the bottom tray of the planter. The potting mix absorbs most of it but now that it's thoroughly soaked a little drips out when I moisten the top. I wish I would have filled the planter up to the top. The level has dropped about 1/4" from where it was initially due to settling and compaction as I've watered. This shade type grass is fine bladed and I don't think it will be able to stand up much more than 3". 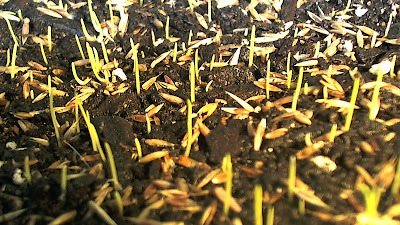 That means only about 2" of grass will be poking out the top of my planter. In a few days I might topdress with some more potting mix to bring the level up further. The germination rate I'm seeing is better than I usually get in my lawn. Probably because I don't have a sprinkler system and my watering isn't as consistent. The wind and sun cause the top of the soil to dry out quickly. I also added significantly more grass seed than the recommended application rate because the seed was old and I expected a lower germination rate than usual.